Create a bedroom space that looks warm and comfortable with this drawer dresser. The piece features seven drawers for storage, and a simple, rustic design enhanced by a warm brown finish. 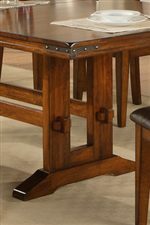 Brass hardware and decorative metalwork corner brackets lend a slight industrial feel to the piece. A humble design with perfect storage, this drawer dresser has everything you need for a cozy bedroom atmosphere. The Mango Transitional 50" Youth Dresser with Metalwork Corner Brackets by Winners Only at Crowley Furniture & Mattress in the Kansas City Area: Liberty and Lee's Summit, MO & Overland Park, KS area. Product availability may vary. Contact us for the most current availability on this product. Introduce old world rustic charm into your home with the Mango collection. This collection includes dining room, bedroom, and occasional pieces that can be handed down for generations as a family heirloom. Select pieces include traditional elements of trestle bases, dark pewter decorative metalwork corner brackets, and classic silhouettes reminiscent of past design styles. Storage abounds, with drawers featuring English dovetail construction and steel ball-bearing guides for easy and long-lasting use. With all pieces complete with a stunning rich finish, there is no denying the rustic beauty of this collection. It simply combines the modern technologies of today with the aesthetic charm of the past. 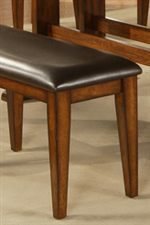 The Mango collection is a great option if you are looking for Transitional furniture in the Kansas City Area: Liberty and Lee's Summit, MO & Overland Park, KS area. Browse other items in the Mango collection from Crowley Furniture & Mattress in the Kansas City Area: Liberty and Lee's Summit, MO & Overland Park, KS area.